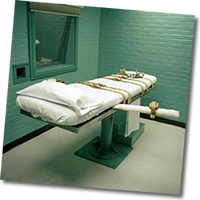 Call Texas Governor Perry to register your opposition to today’s execution in Texas of Michael Wayne Hall, who is mentally impaired. 512 463 2000. Email Perry through his website here. Attorneys for a North Texas man set to die for the 1998 torture-slaying of a 19-year-old mentally challenged woman exactly 13 years ago Tuesday looked to the U.S. Supreme Court to block his execution, the first of the year in the nation’s busiest death penalty state. Michael Wayne Hall, 31, faces lethal injection for the abduction and murder of Amy Robinson. He was one of two men convicted in her 1998 slaying. Hall’s partner, Robert Neville, was put to death five years ago. Lawyers for Hall argued he was mentally impaired and ineligible for the death penalty under a Supreme Court ruling barring capital punishment for those with an IQ under 70. “Mr. Hall’s history of mental retardation reaches back to his childhood,” attorney Bryce Benjet said. In appeals, Benjet questioned an assessment from one mental health expert who shifted from an earlier finding and said Hall was not mentally impaired. Three others who examined Hall said he was impaired. Hall’s lawyers went to the Supreme Court a day after the Texas Court of Criminal Appeals — the state’s highest criminal court — refused to stop the punishment. Similar appeals have failed in other courts. If a dog did this to a human we would have no compunction about putting it down. Just because this killer is human doesn't make a shred of difference. And he was sane enough to torture that poor girl. Good riddance. May she RIP.